Owning and operating a new vehicle will cost a driver an average of $8,469 annually, or $706 each month, according to a new study from AAA. Surprised? It’s likely that the cost of depreciation, maintenance, and repair, including items like tires, fuel, and insurance exceed the monthly payment on your vehicle. And that’s the average. If you own a light truck, the cost is over $10,000 annually or over $830 per month. 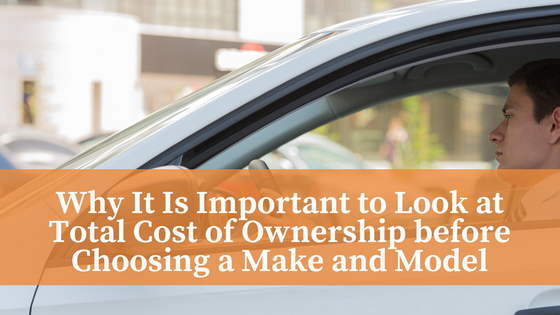 It’s not necessarily an easy task to determine the true cost of vehicle ownership, but in the long run, you’ll thank yourself for having put in the effort. Take this example: a more expensive vehicle to purchase may be less costly to own in the long run. Of course, it’s simple to determine which vehicles cost more to purchase as you just have to look at the sticker price and subtract any additional discounts or incentives the dealer is offering. The real question is how much will depreciation, maintenance, repair, and fuel cost you in the long run? Here are just two examples: Two Japanese brands offer four-door sedans of similar dimensions and performance. Car A costs $1900 less to purchase than Car B, but Car A costs $2000 more to maintain than Car B, making the more expensive car the better deal, by a small margin. That difference can change significantly in different vehicle categories. Popular SUV A purchase price is $1600 more than SUV B but costs $5000 less to maintain over five years of ownership. That’s a savings of $3400, or $680 a year, which would most likely cover one of your loan payments. There are tools available online that can help make the process of comparing the cost to own any two vehicles much easier. For example, Edmunds offers a True Cost to Own (TCO) calculator. The TCO factors in depreciation based on history, interest on financing, taxes, and fees, insurance premiums, fuel, maintenance, repairs and any federal tax credits that may apply for Green Vehicles. In order to estimate certain mileage-dependent costs, the TCO assumes that vehicles will be driven 15,000 miles per year. For a used vehicle, the TCO calculates the years the vehicle has been driven using the nominal difference between the current calendar year and the vehicle's model year, and assume that it was driven 15,000 miles during each of those years. It’s important to note that Edmund’s TCO, as well as the KBB’s 5-Year Cost to Own feature and NerdWallet’s Total Monthly Car Cost calculator, are comparative tools and not a prediction of your actual five-year cost of owning a particular vehicle. This will vary depending on your personal circumstances, such as your driving history and the number of miles you drive each year. Your first step should be to determine the category of vehicle you seek to purchase. Perhaps there’s already a favorite you have in that category. At the KBB site, you can compare the 5-Year-Cost-To-Own of any two vehicles so you can compare your favorite to others in the category. Once you’ve settled on the vehicle that best meets your needs and has a cost with which you’re comfortable, you can then head to the dealer with the confidence that you’re purchasing the best model. Use other tools available online to determine what a fair selling price is for the vehicle you intend to buy and you’ll be driving off with your new vehicle in no time at all.